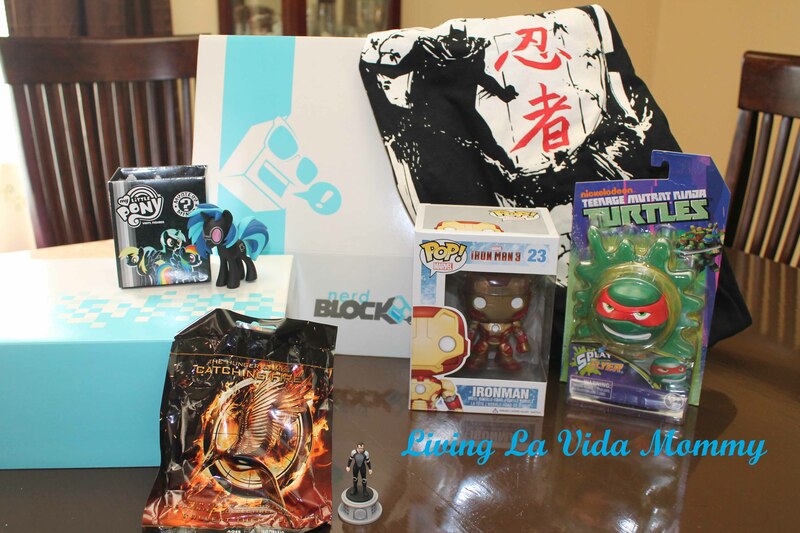 Nerd Block Review January 2014! Have you heard of Nerd Block yet? If you are geeky in any way, or have a loved one who is oh so geeky, then this awesome subscription box is most definitely for you! First things first, Nerd Block is a monthly subscription box completely catered to nerds/geeks. In each box, you find all sorts of goodies ranging from Lord of the Rings Pop Vinyl figures to Nightmare Before Christmas plush toys. There are all sorts of neat goodies, and each box comes with a geeky t shirt as well! You can pick from a very large variety of sizes for your t shirt, from kid sizes, to women’s and even plus size men’s sizes! Better yet, you can change the t shirt size every single month if you like, making sure everyone in the family gets a little bit of geek. I LOVE that! And with partners like Nintendo, Marvel, Star Wars, DC Comics and Adventure Time, just to name a few, well, you are pretty much guarantees awesome in each and every box! The cost is $19.99 each month, plus the cost of shipping, which can vary depending on where you are located. Nerd Block is based in Canada, so shipping to our house is just under $10, making the complete cost of our Nerd Block just under $30 a month. But I think that is a bargain, considering the super nice quality shirts included each month that are also exclusive designs that you won’t find in stores or available elsewhere! Pretty cool stuff, right? Each box has a little bit of everything for our family, there has not been a box yet that has been a disappointment! Are you dying to get a box of your own? Don’t die, just CLICK HERE!! We pay for our boxes ourselves, no freebies here, but definitely look forward to this box-o-awesomesauce each month. Still waiting for something Walking Dead related, hint hint!! And there definitely needs to be more girly stuffs, but that said, we have been subscribing since September and we love it!